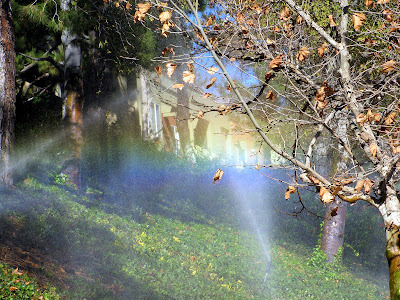 When we were out walking, we encountered this rainbow; created by the sprinklers on the slope. You were very lucky to photograph the rainbow - really nice. I have water sprays in my photos today as well! The rainbows in the spray of water is beautiful! Great captures! Makes me want to go out with my camera and turn on the sprinkler. 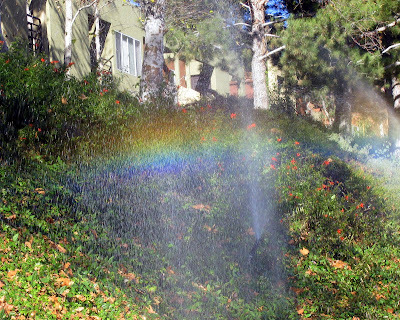 When I was a little kid, the best part about by playing in the lawn sprinkler (don't tell my mom) were the rainbows. 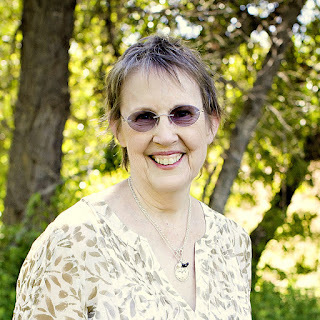 Very nice photo, Jan. It brings back fond memories. Nice play of light and water. Nice capture of the rainbows. You were in the right place at the right time. We won't see sprinklers for a long time! A rainbow just for you to find! The first one makes me want to run through to a secret place. Wow! Nice is that a rainbow? So unique! What a beautiful and different shot Jan. So refreshing. Happy WW. What neat rainbow pictures! I like the berries below also. I don't think I've ever seen berries on honeysuckle. Beautiful shots Jan, I love the colors and you captured it perfectly. What a lucky find. 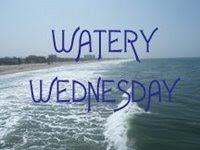 Great post for Watery Wednesday. wow! wonderful, love the way you took the picture, looks great.. I think I would have been late for my destination if I walked by that rainbow! Can't take my eyes off it! A rainbow made by anything is always a welcome sight. Home made icicles in one and home made rainbows in the other. This is journey of new dimensions to explore all these wonderful posts. Such great pictures too capturing the fine mist of the sprinklers. Lovely shots - very special. You were fortunate to see that effect. I saw a double rainbow in Miami over the weekend, in the morning. That is a really awesome shot. I love the way you caught the rainbow. I spent a while looking at the first photo before realizing it was a rainbow. I thought it was a reflection in a pool of water. But then I saw the rainbow in the second, and it made more sense. And I also love the shadows on the leaves of the berries.